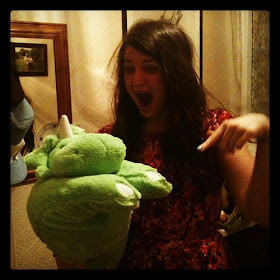 t*rexes and tiaras: Stepping out.. Frankly, as soon as I read the details about this idea, I knew exactly what item of clothing I'd choose. I have absolutely no idea what Past Char was thinking when she bought these trousers. They were on the sale rail at F+F and reduced to just £3, but even so. I *never* wear trousers, so what on earth possessed me to take them home?! Trousers have always been a no-go for me, as I'd say that probably my least favourite parts are my hips, bum and thighs and (although this might just be my opinion), I feel as though trousers are cut to highlight all of these problem areas for me. Being a little bit shorter than ankle length, I decided that these trousers would look even more ridic on me if I tried to team them with flat shoes, so I grabbed a pair of fishnet socks (Primark had these sparkly ones and also a turquoise pair in their sale for 50p each last week and I like them for wearing with heels as a kind of statement, or for layering over opaque tights). I think this photo (above) shows the abject fear in my eyes, but I'm always happy to take on a challenge, and I decided to style these up for a regular day in the office. Quite loose-fitting, (are these chinos?! 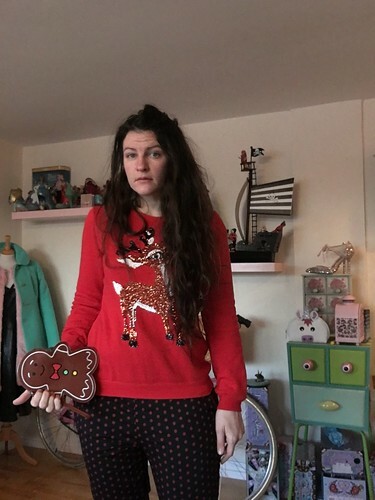 ), the trousers are black with red polka dots, which I felt leant themselves to being worn with this sparkly red reindeer sweater, which a friend tracked down for me in her local George, as it sold out just about everywhere. I dig it out each year! 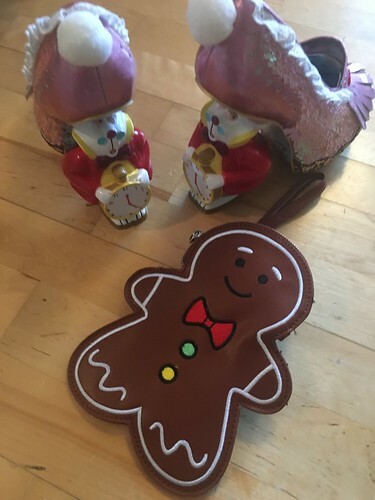 Always a fan of festive accessories, I was happy to have the chance to use this little gingerbread man - an impractically tiny clutch bag which came from Forever 21 a couple of weeks back. I think he'd be okay for keeping your essentials safe if you were off to a party over the festive period, perhaps..? 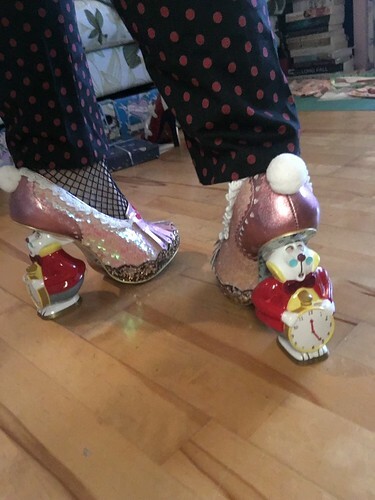 And finally, my shoes - these White Rabbit heels from Irregular Choice never fail to attract plenty of attention, so I was kind of hoping to use them as a distraction tactic - i.e. check out my shoes, not my trousers. I'm not sure whether it worked. I felt awkward in this outfit all day, possibly because I just am not used to wearing trousers, at all? It was odd. 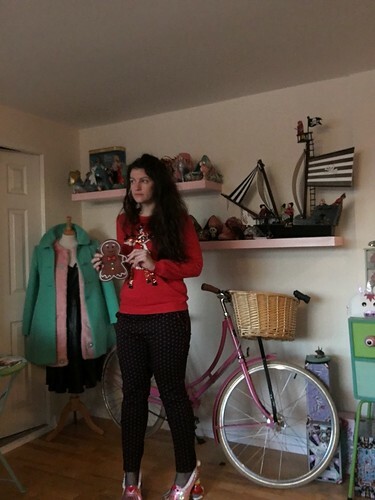 People at work commented on the fact that this was unusual for me, which didn't help my confidence, and after work I had to go and run some errands, and I must admit I was very close to getting changed before I went. I braved the town without changing, though, and you know what? The world didn't end. I don't think I'll wear them again, as I spent the whole morning at work looking down at my legs and berating myself for my hideous thunder-thighs, but I took on the challenge and I made it through the day in trousers. 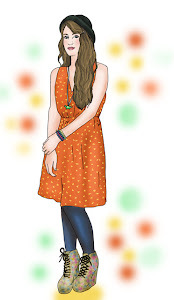 Do you have anything hiding in the depths of your wardrobes which you've shied away from wearing? 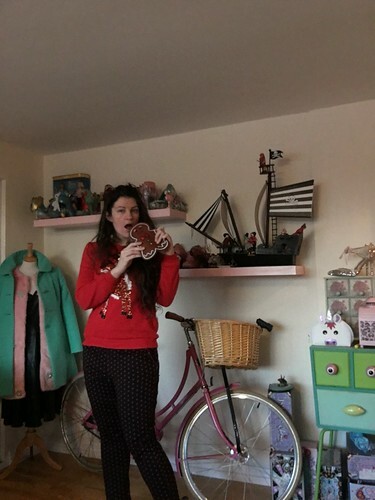 Go for it and use the #wearwhatscaresyou hashtag to share your outfits..
You look fine in trousers - you really do! I know what you mean about the comments though - I grew up as a skirts/dresses only person and was in my 30s before I bought a pair of trousers. When I first wore them to work I had a lot of comments but I persevered and now wear trousers regularly - you ought to do the same. You ook great, I felt awkward first time I ever wore pencil skirts but turns our they really suit me!